The combination of Matcha, Mint leaves and select proprietary spices make this Matcha latte blend our stand-out favorite! Refreshing for those hot summer evenings, or delicious as a hot matcha green tea latte, Matcha Mint is a versatile tea for any occasion.....not to mention that you get the incredible benefits of matcha green tea. Sweetened with organic Coconut Nectar and just a smidgen of raw, organic green stevia. Absolutely delicious! 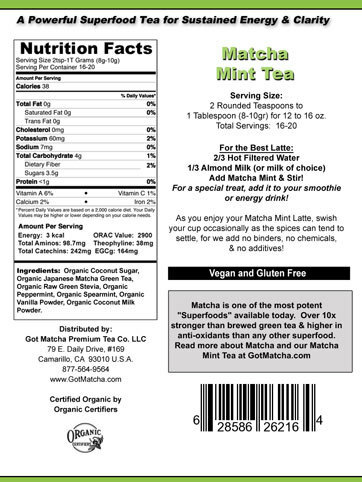 Our Matcha Mint tea is one of the most refreshing matcha latte tea blends on the market. When drinking this terrific blend of Matcha, peppermint and spearmint you forget that you are drinking tea because it is so light and cooling. Whether you need a digestive or relaxing aid for your internal organs mint leaves can be enjoyed by everyone young and old. Matcha is also an integral player regarding digestion so by combining it with our varieties of mint you really having a winning tea. Plus you are not just drinking the extract of mint you are actually drinking the entire mint leaf that has been dried and ground into powder. Just like with the Matcha we are giving you fresh-dried mint leaf in its whole-food form which allows your body to receive the max amount of nutrients possible. 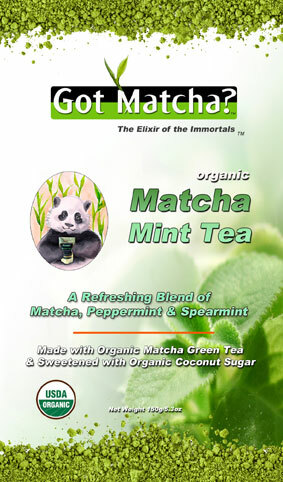 Mint also has energizing and recharging properties that complement Matcha’s invigorating ability. Consequently this is the perfect matcha-wakeup green tea latte in the morning and fantastic as an iced green tea latte in the afternoon when you need that refreshing pick-me-up that will last for hours. Did we mention the flavor is delightful? There is no bitterness just the perfect fusion of peppermint, spearmint, matcha, a hint of citrus to enhance the mint and just a touch of coconut to enhance all of the flavors and remove any bitterness. The coconut sugar adds a light sweetness that is the perfect compliment. We hope you enjoy this new matcha latte blend as much as we do. 1. We take a tall mug of hot or boiling 10-12 ounces – 1/3 filtered water and 2/3 almond milk or milk of choice. 2. We add 1 tablespoon of the Matcha Mint and stir. That is all there is to it! Simple, quick and tasty. Where the Matcha can tend to clump a bit when mixing, with our Matcha Mint green tea latte, the spices and the Coconut Sugar act as a perfect blending agent, so you have no problems with clumping. Tip…let your latte sit for about five minutes before drinking to enhance the minty flavor of your drink.